I’ve been desperate to find local venues (within 15 – 20 minutes) as they enable me catch a sneaky hour or 2 while walking the dog in the summer evenings. I’ve never bagged a lump (15lb+), so when I found a fishery which only takes 8 minutes to drive too I was very excited. Finding it seemed easy enough, even if the verbal instructions on how to get there seemed incredibly vague. With my smart phone set to the location I left, I planned to give the water a good once over on pole tactics before trialing it later on in the year for something bigger. Arriving at the venue one thing I had overlooked in my excitement, a venue this high meant it was windy. Bloody windy! Pole tactics may prove difficult, fortunately I had a lead rod in the carryall (and waggler if I stubbornly stuck to my idea of wanting to use the float). The path down to the lakes is accessible by car (when dry), but the “road” is very much a case of driving down the side of a field. There are 2 lakes (Mallard and Pumphouse) and an abandoned digger on the grassy verge next to the lakes. With the wind being as strong as it was, there was no chance of fishing Mallard today without something snapping. So walking down to the pumphouse lake I managed to find a peg which offered quite a lot of protection from the prevailing wind. Although I had plenty of other rigs tied if the bigger fish came calling. I shipped out, plumbed up and was glad I made some deeper rigs, as I was fishing into 6ft+ of water. With the margins sloping off severely at 18 inches swiftly dropping off to 3½ft. I dropped in a small ball of Baittech Pro Natural Dark in the margin and another in and open water swim at 9 meters shipping out double red over the top. The float stood static for the best part of a minute before I received my first indication… (which I missed). A bit of jigging up and down with the maggot, and I was in to my first fish of the day. 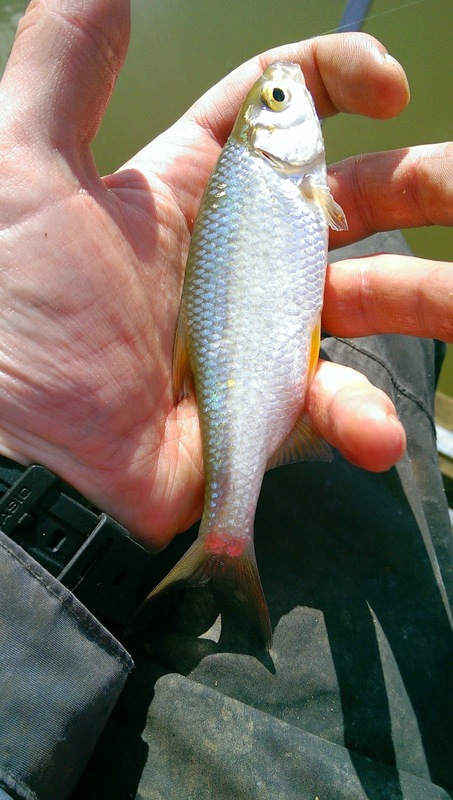 A small Roach, which I think had ever been caught before. Bites weren’t very easy to come by, and after an hour solid fishing I had roughly 2lbs of silver fish. It was tough going, then I noticed the fly by. A pair of cormorants flew over, and landed in the top pond. Lakes like these would be easy pickings for the flying fish vacuums. I carried on alternating between maggots and caster but there was no real increase in the size of the fish. After 2 hours, and while I had a chance (there was a of dead weed floating around on the surface) I went down the inside on meat to see if anything more sizable was feeding. Absolutely nothing seemed interested in meat, although a switch to caster did result in the best Roach of the day. A dog walker then came down to the lake and asked how I was getting on. Apparently I was only the 4th person he had ever seen fishing the lakes (he was the first). He informed me that he had caught several big carp from both lakes, but the lakes were really prone to cormorant visitors (which he admittedly to trying his best to chase off). It was good to know that there were bigger fish in the lake, and beyond the gullet size of cormorants, but it also explained why the silver fish were quite difficult to come by. He went on to say that the owner very rarely inspected the lake and left it to its own devices. That much was obvious from the abandoned digger, the honesty box and lack of any defined fishing locations around the lake. There either weren’t that many of them, they were very weary or a mixture of both. A quick note on the ledger rod. 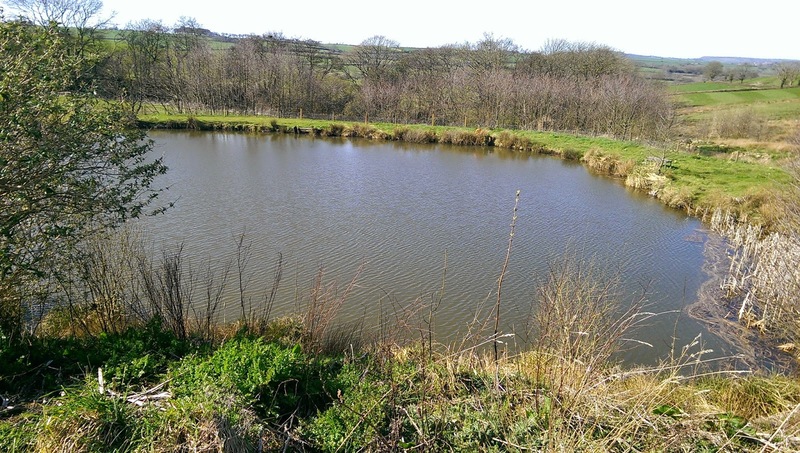 I decided to sit it out on slightly bigger baits, alternating locations and plain lead or small feeders in the hope of stirring the appetite of one of the lakes lumps. I didn’t get a touch all day. I used Corn, Pellet, Worm, Dead maggot, small boilies. not a flipping bean! That’s that really. 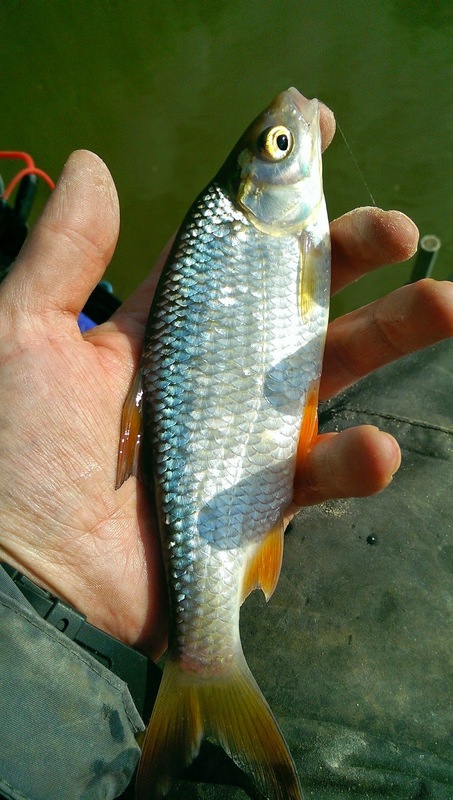 I carried on until mid afternoon, and successfully managed to catch a few more Roach and Rudd but nothing prolific. By the end of the day I had a small bag of silver fish, but I don’t think I managed to hit double figures. It’s a shame really as the lakes are really quite nice, and with a bit more care and attention, a bit of a re-stock and some anti-cormorant apparatus it could be a great little fishery, especially for £5 a day. I probably will head back out there for an evening session for surface carp, but I won’t be going back for the silvers. Accessibility – ** Finding it was difficult and in the rain (fortunately it was dry), walking down through the field with your gear would be unpleasant. 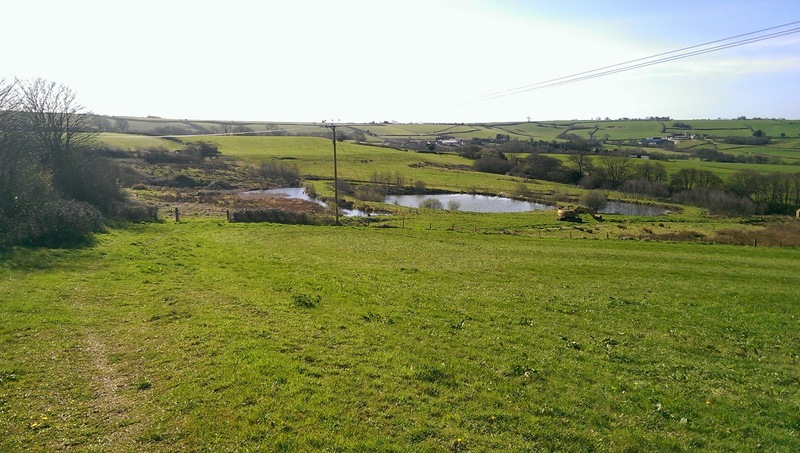 Disabled Access – ½ – It would be almost impossible to use a wheelchair on the this terrain, although if you could get to the benches around the lakes the views are fantastic. Trip #8 – Toms Pond, good weather for ducks!